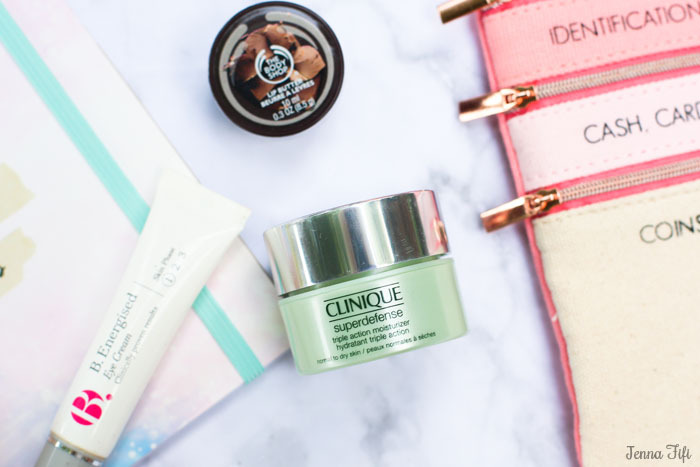 A beauty bag may sound like the least of your worries when you’re preparing for a 24 hour flight, but a little bag of grooming treats will freshen you up, keep your skin hydrated and make sleep and flight stopovers far more bearable. I also found having some sort of pampering routine helped to keep me sane and broke up the duration of my flight. Not only will your skin thank you, but so will your fellow passengers who will appreciate the fact you’re wearing deodorant! Here’s what I pack in my carry on every time I fly. If you read my latest travel post on How to Pack the Perfect Carry On For a Long Haul Flight, you’ll have seen that I pack my beauty essentials in two separate Narciso Rodriguez bags. Airports only allow passengers to travel with liquids that are under 100ml, and often require you to present these liquids in a clear, plastic bag for inspection. To make things easier, I keep all of my liquids in the larger bag, and ‘dry’ items such as my toothbrush, nail file and compact powder in the smaller one. Once I’m on the flight, both bags come with me to the bathroom and are always within reach when I’m sat down. The first thing I do when I get on the flight is cleanse my face and neck and remove all of my makeup, I also do this before every stop-over to keep my skin as clean as possible. Planes are certainly not the most sanitary of environments, so I try and cleanse as much as I can. Baby/cleansing wipes – B. 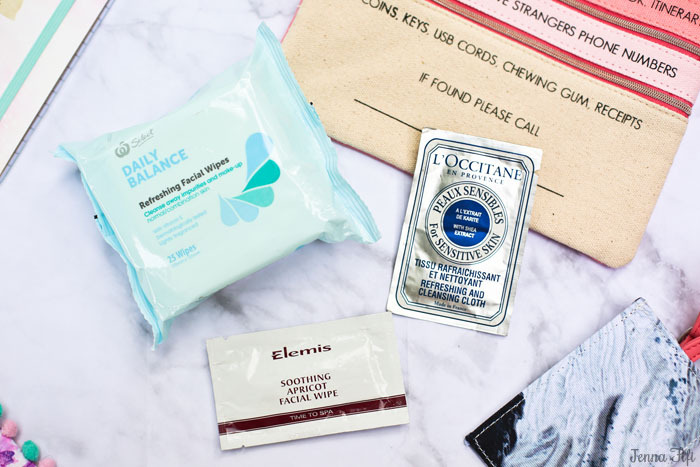 Pure Sensitive Micellar Cleansing Wipes are my long haul flight savours and what I’ve used for my last 3 flights! However cheaper cleansing wipes are also great for freshening you up. 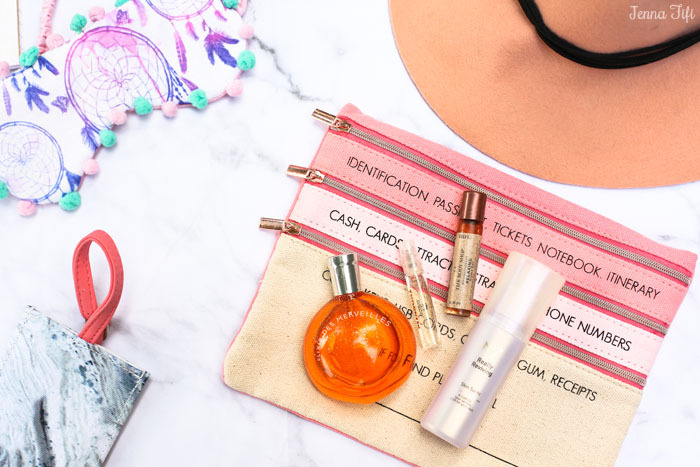 Keeping a pack at hand throughout the flight will help to refresh your skin and make you feel a little bit cleaner-ish. If you don’t want to take an entire pack, simply place a few in a sealable, plastic bag to save space, they’ll remain fresh throughout your journey. 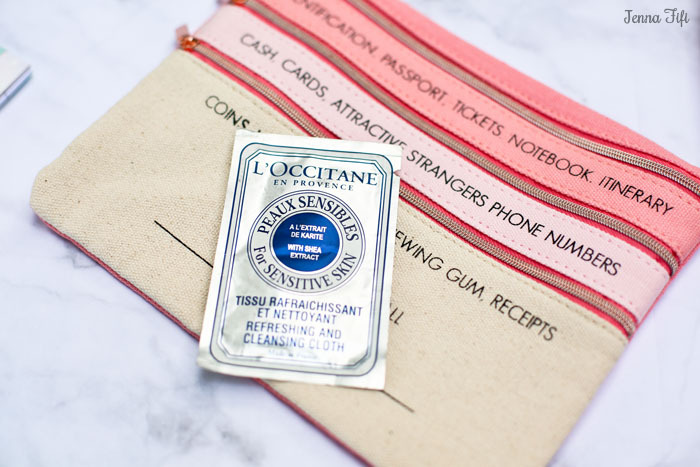 L’occitane Refreshing and Cleansing Cloth – I apply this at the start and the end of my journey as a pampering treat. The cloth is soaked in a rich shea lotion, soothing cassia and orange blossom floral water, which refreshes and gently removes makeup effortlessly. A few of these take up virtually no space at all, so it’s a guilt free luxury to have on board. Elemis Soothing Apricot Facial Wipe – Another indulgent option is the Elemis Facial Wipe, which perfectly harmonises the skin. These are ideal for keeping in your handbag at all times anyway, not just for a flight. The atmosphere on board is incredibly dehydrating, making eyes, lips and skin feel dry and uncomfortable very quickly. Drinking lots of water is essential to staying hydrated whilst travelling, but applying moisturisers regularly can help a great deal. Lipbalm – Smothering on The Body Shops Lip Butter in Cocoa keeps my lips hydrated and smells amazing. It’s a lip butter I wear regularly at home, so it’s comforting to be surrounded by familiar scents when I’m jetting off. Hand moisturiser – I apply this quite a lot, and often give myself hand massages to pass the time and ease me into a more relaxing state. My favourite is The Body Shop Shea Body Butter, the moisturiser is rich and velvety and absorbs quickly into the skin. It’s also a very subtle scent, so it shouldn’t irritate the people around me. Face moisturiser – The atmosphere in planes wreaks havoc with skin, and can leave your face feeling like the Sahara desert. I only have to apply my Clinique Super Defence Triple Action Moisturiser once or twice throughout the journey and my skin feels incredible once I land. Eye cream – I apply a small coat of this an hour before landing at each stop over and destination. 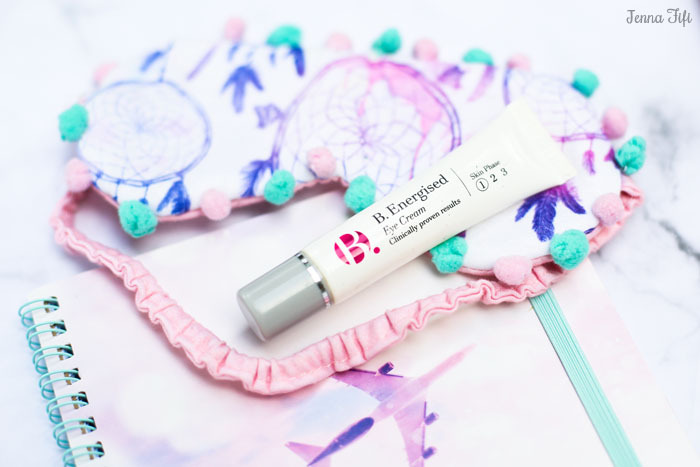 B. Energised Eye Cream helps to wake me up and reduces puffiness around my eyes, which I have in abundance after flying. Keep yourself as clean as possible with these flying essentials. I use all of them liberally and freshen up several times throughout the journey. Feeling fresh makes the flight a much more pleasant experience, for me and surrounding passengers. 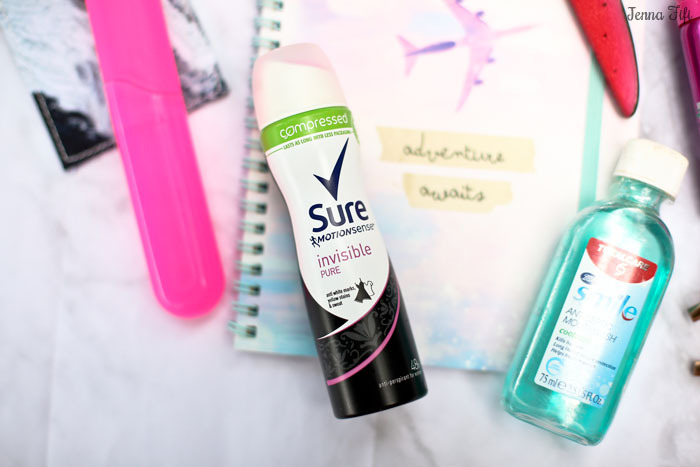 Miniature deodorant – There’s just something about buying miniatures that instantly induces pre-holiday excitement! Choose a reliable deodorant and use liberally. Mouth wash – In miniature size, of course. I can make do with just a tooth brush and tooth paste, but I always find the exhilarating coolness of mouth wash is exactly what I need at the end of a long flight. 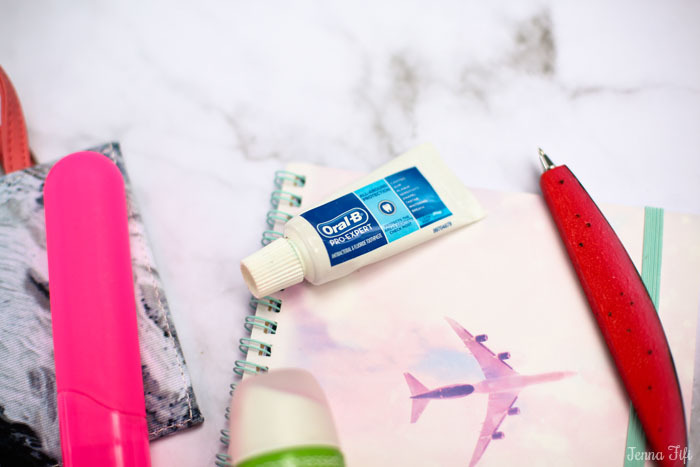 Tooth brush, case and tooth paste – This is a must. I brush my teeth countless times on the flight to keep feeling as clean as possible. Dry shampoo – I only use this at the end of my flight to inject some life back into my wilting hair. Plus Lee Stafford Dry Shampoo smells incredible! Hair band – I look a bit like a lion when I’ve got my blonde tresses bunched up around my neck pillow. It gets pretty irritating after a few hours so I try to keep my hair off my face for most of the flight. Plane hair is far more prone to grease and tangles so just throw it up into a top knot. Hair brush – Hair takes on a very special form after being squashed against the back of a chair for 14 hours, all that wriggling and neck rolling will leave your hair in one big tangled mess. Hair brush? please. Scents can do more then just keep you smelling fresh, they can also bring a little comfort by reminding you of home, or calming your nerves and easing you into a relaxing sleep. Small, or miniature perfume – Keep yourself smelling like roses with a perfume sample to spritz on when you pop to the bathroom. I pick a scent that’s light, refreshing and reminds me of home, such as Hermes Elixir Des Merveilles which is just 30ml. Try not to pick scent that’s overpowering, as not everyone will love your fragrance as much as you. 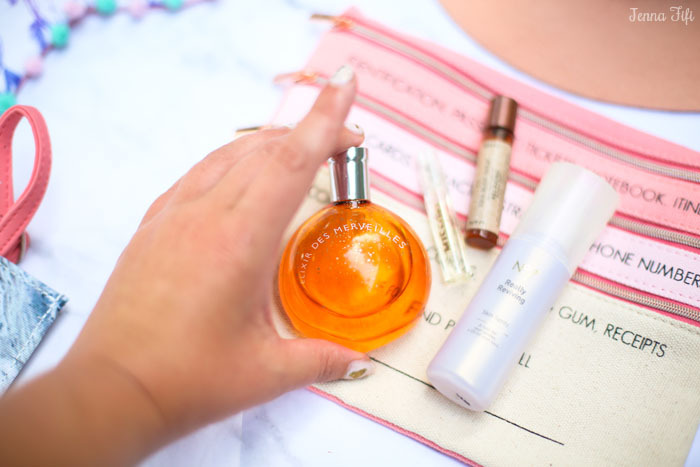 No7 Really Reviving Spritz – Okay, I’ll admit you’ll still survive your journey without this one, but I always spritz this over my face when I nip to the bathroom. It’s revitalising and smells like calming lavender – perfect before some down time. Aromatherapy roller ball – I’m quite fortunate to be able to sleep anywhere, and through anything but I still like to have a bedtime routine, even on a plane. Once I’m all snuggled, I apply my Body Shop Aromatherapy Relaxing Aroma Ball to my temples. The essential oils are incredibly relaxing, and calming in times of stress. I always apply it a bit more liberally when children start screaming! 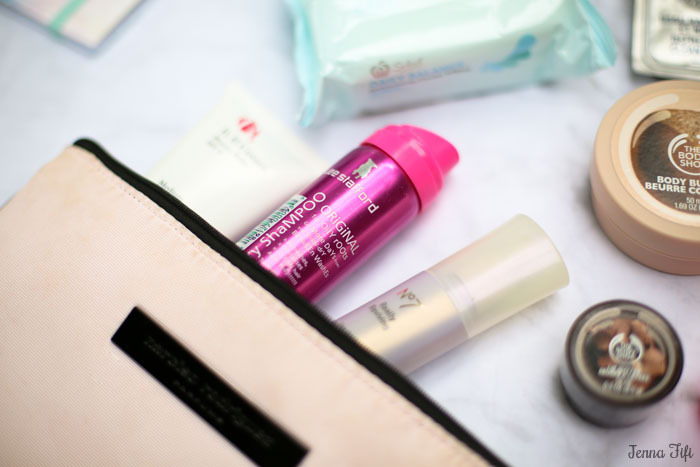 I avoid makeup throughout the entire flight, but I like to keep a few staple products at hand to touch up blemishes, tired eyes or add some glam right before I reach my final destination. 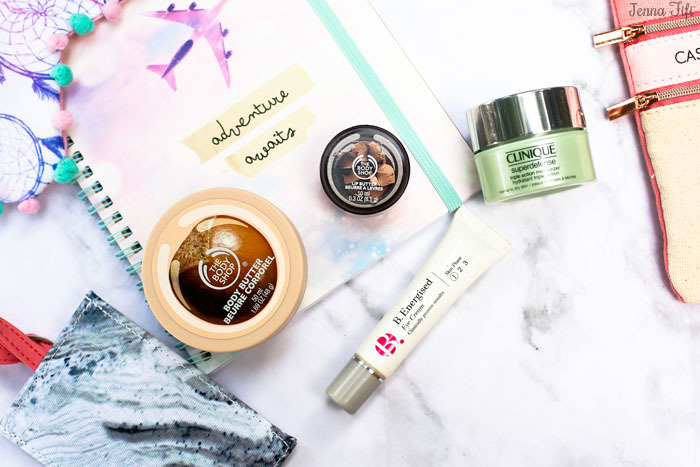 B.B cream – I just cannot be dealing with makeup on a long haul, I like to keep my skin cleansed and hydrated and there’s no way I could keep up with the maintenance of a full face for over 30 hours. 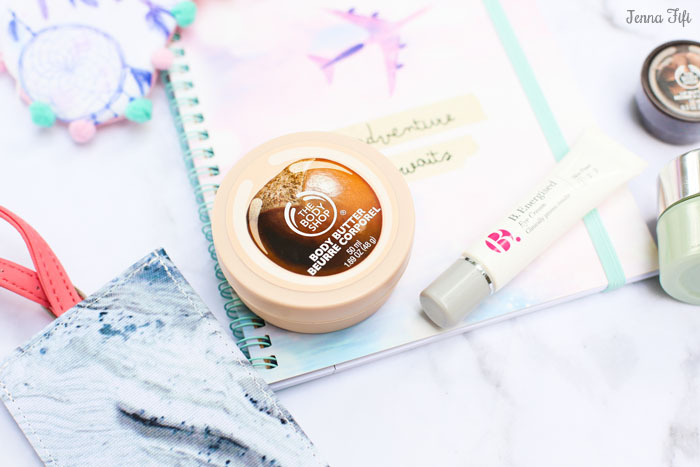 But when I stop over, or right before I land, I apply a thin layer of B.B Cream Beauty Balm to give me some light weight coverage, whilst also providing SPF and skin rehydration. Lipstick – ‘Pour yourself a drink, put on some lipstick and pull yourself together’ were the wise words of Elizabeth Taylor. Adding a pop of colour to my lips once I land can make me feel like I’ve got everything sorted and I’m ready for anything! Powder & brush – When I’m landing in a hot or humid environment, I always pack a compact powder and brush to reduce shine around my T-zone. 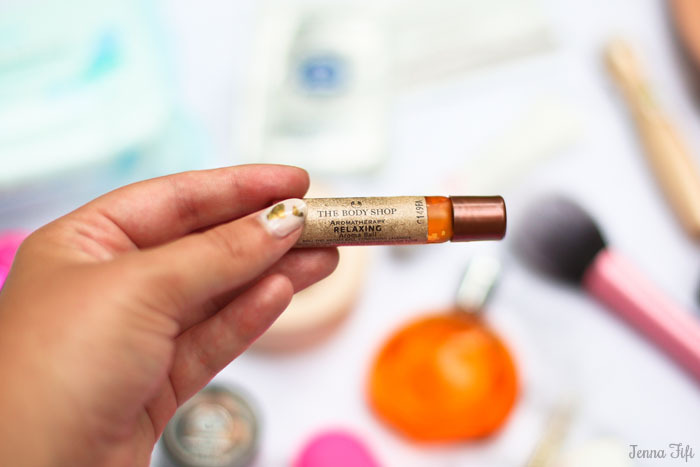 Under eye concealer – My Garnier Undereye Roll On Concealer goes with me everywhere regardless of whether my feet are firmly on the ground or 40,000 feet in the air. I have eye bags even after a good nights sleep, so when I finally get off the plane I definitely need a helping hand from one of my most reliable beauty products. I love the fact I can just roll this on, before letting it set for 5 minutes (cue strange looks) before patting it around my eye. It hides dark circles with impressive coverage, and minerals to help reduce puffiness. 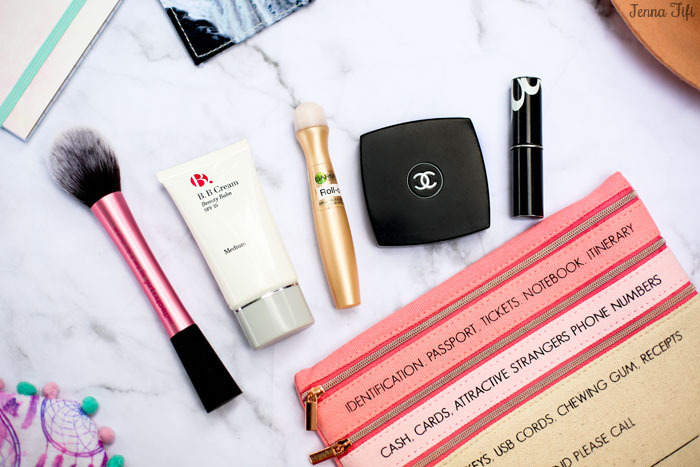 Nail File – Being stuck with jagged edged nails and no nail file is my idea of hell, I haven’t actually used my Champneys Nail Buffer on a flight yet, but being caught with fabric snagging nails it’s not a risk I’m willing to take. 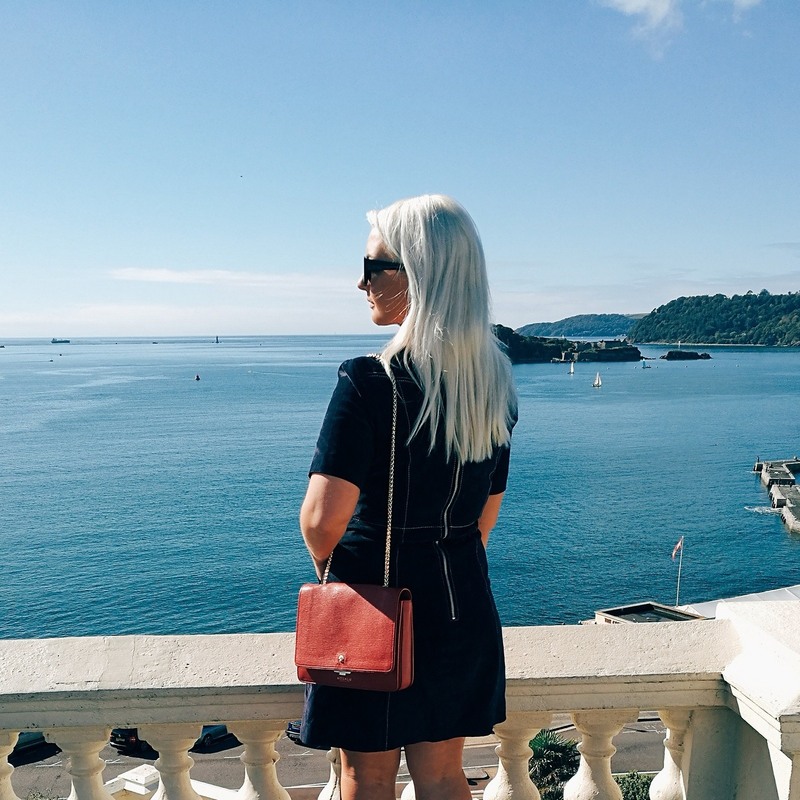 If you want to know what else I pack in my carry on case, take a look at my guide to Packing the Perfect Carry On For a Long Haul Flight, and subscribe to see more travel tips and ideas! 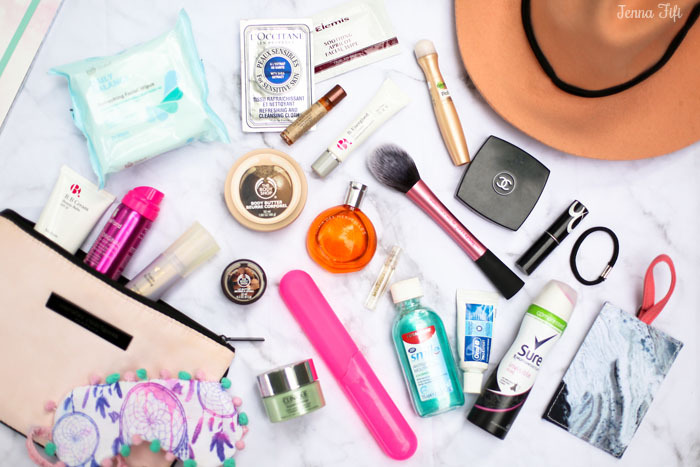 Do you have any staple beauty products that come with you on a flight? I’d love to hear about them! I need to pin this, I am flying to Italy this summer and it would be nice to have some of these items for the long flight!! This is great, and so organized! When I pack I usually just throw things in my suitcase and hope for the best! You have a great collection of products! Thanks for some great recommendations! i take long flights pretty often but i never really bring anything to freshen up my skin with, i should probably start doing that! I never bring enough of these types of things with me! I bet I would feel SO much better if I did. Next flight! As my husband is European and I'm from South Easy Asia, long haul flights occur with some frequency in our lives. Some of my indispensable must-haves include a Kbeauty sheetmask (as well as eye masks because mine puff up), and a handy lymphatic hand-massage thingy (the name of which eludes me at this moment) which I use on face/neck, calves and feet. Without these things, I'd probably land looking a wee bit like a marshmallow!! Ohhhh, this is great for long distance travelling! Such a great collection of traveling goodies! I have to have cleaning wipes and moisturizer with me on long flights. Makes me feel so much more refreshed. Great tips! I hate having to spend much time with flights. My skin gets super dry. I always make sure I have moisturizers and cleansing products with me. Love all these beauty essentials!!! Such amazing products! these would have all been so useful on my last flight. I'm definitely going to take your tips! thanks! fun post! I have never tried an eye cream! sounds fun! Such an amazing article! Thanks for sharing! I love having a few products to touch up and freshen up with just before the plane lands! A moisturizer is a necessity for a long haul flight! 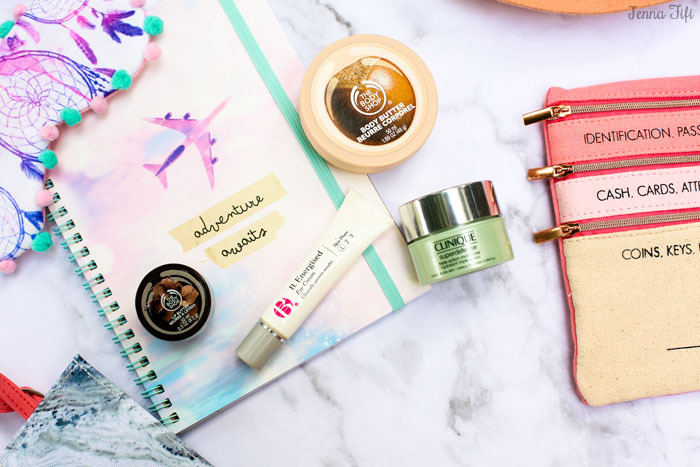 Such a great post, so many wonderful products! I always find even short flights really drying for my skin so moisturising is really important. As is taking off any makeup as soon as possible. Great round up! Moisturizing is so important with how dehydating flights are. Last time I did an overnight moisture mask and it worked wonders! Love the clicks <3 You have a fabulous collection of products! This post is such a helpful one for disorganized people like me, thanks for sharing!! I love to have a hydration mist with me on the flight, it's just so refreshing, and it moisturizes my skin. I really hate the feeling of, tight, dehydrates skin! great tips. I think I have about everything on your list. its def an essential when you travel.